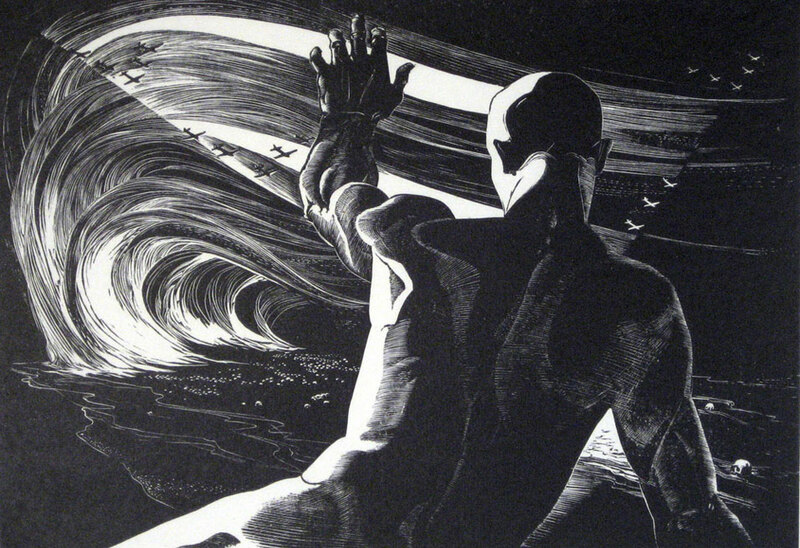 Leon Gilmore, Let the Living Rise, 1937, wood engraving, 8 x 11 3/4". MORAGA, CA.- Hearst Art Gallery at Saint Marys College will present California in Relief: A History in Wood and Linocut Prints, on view July 25  September 13, 2009. California in Relief presents a historical survey of relief prints in Northern California. Relief prints include, woodcuts, linocuts and wood engravings. This exhibition traces the history of one printmaking media and by doing so brings to light both long standing artistic movements; fascinating groups of artists working outside the mainstream; as well as well known artists from across the last century. Art movements that focused on relief prints over the past century continue to have esthetic heirs working today. Important and influential artists who are often overlooked in the traditional art historical narrative created powerful prints that became part of the history of California. Significant numbers of women were pioneers in all the various traditions of relief prints. Influences from Japan and Mexico played an influential role in the development of different styles. The overall diversity of voices and imagery is held together in this exhibition by the unity of the technique which imparts a distinctive graphic quality to the work of artists today as it did in 1900. The exhibition includes approximately seventy-five artists working in the media of relief prints from the early days of the 20th century to the present. Ninety prints, and books in the exhibition are divided into eight areas of focus: the Arts and Crafts movement; the Labor School; wood engraving; Asian influence; abstraction; the GI Bill and the establishment of the university print department; Latino art; and fine press print publishers. The story of the development of the relief print in California carries with it the story of California. The technique formed the basis of several distinctive art movements. And the technique was associated with several cultural movements as well. Women gained a powerful and early voice in this media, as did the Labor movement and later Latino artists. Japanese Influence: While the Arts and Crafts movement was influenced by Japanese art several artists went directly to the source and traveled to Japan to study the rich printmaking techniques and esthetics of that culture. Bertha Lum, (1869  1954) and Helen Hyde (1868  1919) both went to Japan in the very beginning of the century to learn techniques and gained wide recognition with their work. More recent artists from Patricia Cosper Brandes (1935  2005), to Micah Schwaberow (1948 -) have continued that tradition of study. Additionally, the influence of artists coming to California from Japan is seen in the work of Chiura Obata (1885  1975) who created a series of color woodcuts of the Sierra mountains. Wood Engravers: In the 19th century wood engraving was used as a commercial reproduction method but later wood engravers brought new forms and new artistic responses to the media, and created black and white work with beautiful tonal ranges which defined a style often associated with the Regionalist artists of the 1930s. Mabel Farmer (1903-1974) , Leon Gilmour (1907-1996) and Charles Surrendorf (1906-1979) created images that, like the Arts and Crafts artists, showed the beauty of California, but with an emphasis on the sculptural quality of the land emphasized through their black and white technique. Contemporary artists working in this technique include Richard Wagener and a student of his Toru Sugita (1964-). The Labor Movement: The Labor movement utilized woodcut for its expressive power. And in San Francisco the California Labor School became the center and inspirational force for many of these artists. At the same time Mexican muralist Diego Rivera (1886 - 1957) brought an esthetic style that was central to several artists associated with the Labor movement. His effect was critical to artists from Emmy Lou Packard (1914-1998) and Victor Arnautoff (1896-1979) who assisted Rivera on his murals, to Frank Rowe (1921-1985) who created posters with Black Panther members in the 1960s and Rachel Bell Romero (1950 - ), who did woodcuts for various political actions in the 1970s. This wealth of activity and interaction produced great stylistic and political influence that continues on to the present day in such artists as Anthony Ryan (1965 -). Abstraction: In the postwar era abstraction came to define the American art world. Abstract artists working in woodcut found a media rich in expressive form and receptive to spontaneous creation. Again in this area, as in most of the relief print traditions, women found an early and powerful role. Hildegarde Haas (1926  2002) and Ynez Johnston (1913-1995) were two who moved early on into abstraction, with more recent artists such as Sandy Walker (1942 - ). GI Bill Effects: After World War II art departments in Colleges and Universities around the state found themselves suddenly in need of teachers to create new classes for the GIs returning from World War II. The gap was filled with artists often from outside of California with no particular affiliation to any movement. The artists of this new academic movement were independent and individualistic often placing a great emphasis on technical proficiency. Janet Turner, Paul Feldhaus (1920  2005), Sylvia Solochek Walters (1938 - ) and later the technically masterful Roy Ward Ragle (1944 - ) are examples of artists of individual visions whose work developed in relation to the university setting. Latino Movement: A more recent phenomenon in relief printmaking dates from the 1980s. In the early days of the Chicano Art Movement artists worked primarily in screen print. Emmanuel Montoya (1952 -) found his way to this technique by developing connections with artists in Mexico. Several artists born in Mexico brought the traditions of relief printmaking to Northern California, including Diego Marcial Rios (1962-), Ricardo Gato Garcia (1965-) and Artemio Rodriguez (1972 - ). While juan Fuentes (1950 - ), moved to the media of linocut after many years working primarily in screen print. This movement brings a new focus on the Latino vision of relief printmaking in Northern California. Fine Print Publishers: The print publishing phenomenon has principally focused its production efforts on etching however a number of relief prints have been created over the years by artists working at presses such as Crown Point Press. Important artists such as William Wiley (1937 - ), and Robert Arneson (1930-1992) created work with the help of printers at these presses. In some cases these artists never touched the wood, but created the original design. This too is a tradition with a history going back to Japan where print publishing houses for woodcut were the most common way to produce prints well into the mid- 20th century. In fact in the 1930s Chiura Obata brought his watercolor paintings of the High Sierras back to Japan to Takamitsu publishers in Tokyo to have woodcut prints created from them. Crown Point Press used the same printing company when they wanted to create prints with Wayne Thiebaud (1920 - ) from his watercolors in the 1980s. In following the various streams of artistic movements it is clear that long standing traditions are still at work, and that new traditions are being born. With this view of one media that embodies so many traditions and at the same time contains such a diverse and rich heritage the individual accomplishments of the artists stand out more clearly in relief. The Franklin Asks -- Race: Are We So Different?